Alright everyone, time for your monthly/quarterly lecture about balancing your high octane treats with stuff that is frozen, but still healthy. Tonight's treat falls into the healthy category. To be honest, I can't believe I suckered myself into buying another Whole Fruit product. I haven't made that jump to where I'm comfortable with sorbet and that was driven home by bad experiences with both Whole Fruit Raspberry Sorbet and Whole Fruit Strawberry Fruit Bars. However, I'm not one to give up easily, and if I remember right, they were pretty cheap. They don't say new, but I'm pretty sure these are new for 2012. They come in strawberry banana (reviewed at freezer burns), pineapple mango (I don't do pineapple), and mixed berry. You get four 4 fluid ounce cups at a whopping 100 calories per serving. Not exactly what I expected. There's a green lid that pops off and underneath is our little unsealed friend. As you can see, there aren't "big" fruit chunks like you see on the packaging. I've been through all four of these and they all look identical. This isn't a complaint since I'd rather not have lumps in my "smoothie" anyway. Now you are suppose to throw these in the microwave, but given my disdain for microwaving anything in plastic (I don't care what you say, it's unnatural and bad for you), I simply left these on the counter for a bit to get soft. I dig in and you know what, I like it. 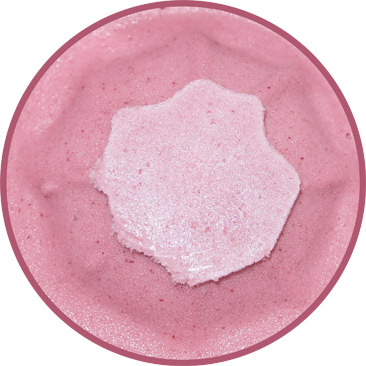 It's not nearly as harsh as their sorbet, but it feels fruitier than a typical sherbet. It's a happy compromise and I'm ok with a small serving. I'm kind of smushing it as a go so that it has more of a softserve texture, and it's working for me. 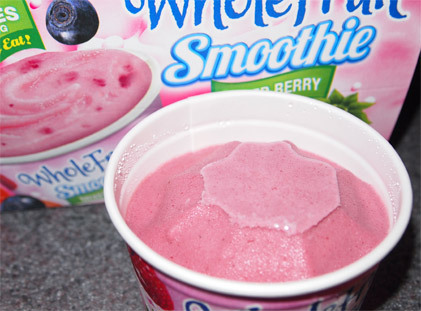 Is it really fair to call this a smoothie? Iunno, 4 ounces isn't exactly a filling drink, I'd much rather run with this as a portion controlled treat. 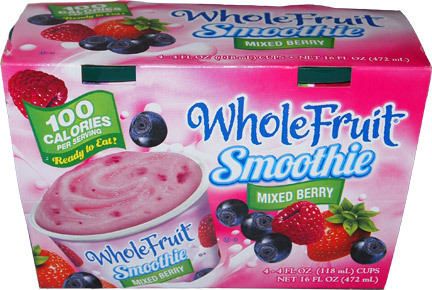 How can you go wrong with a 100 calories of frozen? Ok, there are lots of ways, but this aint one of them. On Second (and third and fourth) Scoop: I've been through all of these and they are a neat little treat when I don't want to weigh myself down with a super premium ice cream. My only compliant is that by the 4th sampling, I was kind of getting bored. I meant what I said that it's a neat healthy treat, but it's a bit monotonous.. I wouldn't mind keeping these in the freezer, but I would pace them out to say once a week. Verdict? respectable balance of a sorbet and a sherbet.